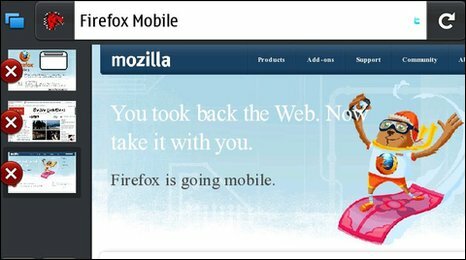 The first mobile phone version of the popular web browser Firefox is "days away" from launch, the head of the project has told the BBC. It is currently going through final testing and could be released before the end of the year, said Jay Sullivan at Mozilla, the group behind Firefox. Software will mean that any web pages open in a user's desktop browser will automatically open in the mobile version. "At the end of the working day you can walk away from your computer and keep on going on your phone," Mr Sullivan told the BBC. "It encrypts all of the information and sends it back through the cloud between your desktop and mobile." He said that providing there were no "show stoppers", the software could be available to download "within the year". 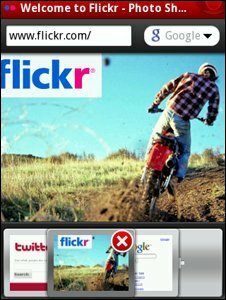 The browser will be available to download from the Mozilla website and then offered in Nokia's Ovi store, so that N900 owners can download the software. The organisation is also developing versions for Microsoft's Windows mobile and Google's Android operating system. However, he said that it would be some time before iPhone users would be able to use the browser. "Apple is very restrictive." he said. "As it's a pretty closed platform we don't see that happening soon." Apple only allows browsers based on its Webkit engine, which is used to power its Safari browser, to be loaded on to the iPhone. Firefox uses alternative technology. When it launches, Fennec will compete with browsers such as Opera, which is the most popular mobile browser according to analytics firm Stats Counter. Safari, which comes bundled with the iPhone, is the second most popular, whilst Nokia's own browser is third. The mobile version of Firefox will hope to follow the success of its desktop browser. Stats Counter has reported that the latest version of the Firefox browser has overtaken Internet Explorer 7 (IE7) as the World's most popular browser with 21.93% of the market, compared with IE7's share of 21.2%. 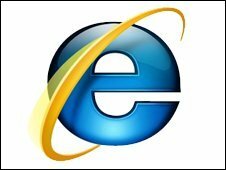 However, other firms suggest IE still has the lead on Firefox, whilst most agree that the various versions of Explorer combined still dominate the web browser market. Fennec has been in development for the last year and a half. The new software has many of the features of the desktop version, such as tabbed browsing, and an address bar that doubles as a search box. However, the mobile version will also scale pages to fit the device and will support functions such as tapping the screen to zoom in on a page. Mr Sullivan said it would also be the first mobile browser to have "add-ons", small pieces of software that add functionality to the browser such as news readers or online games. They can also be used to customise the look and feel of the browser. "Because it is a browser for a mobile device, the add-ons will be different," said Mr Sullivan. "You'll see ones that use geo-location and exploit how the device is tilted." The add-ons will add functionality to the phone that is currently offered by mobile apps. These small specialist pieces of software have become increasingly popular. For example, Apple now offer more than 100,000 apps in its store ranging from games and social networks to news readers and tools that allow people to use sites such as eBay or Amazon on the go. However, he said that he did not think that the browser would completely replace these apps. "They will co-exist," he said.